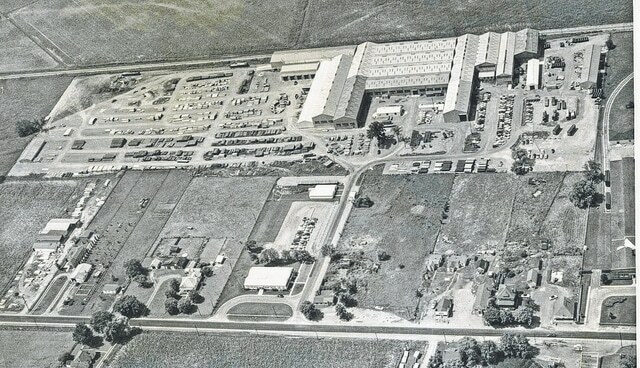 This is an aerial view of the Armco Plant taken in July of 1956 six years after it opened in Washington C.H. All workers at the Armco facility are being invited to a reunion on Friday, Aug. 7. The eighth Armco reunion is planned for Friday, Aug. 7 at the American Legion in Washington C.H. Sixty-five years ago Armco Steel Corporation constructed a pipe manufacturing facility in Washington C.H. Later, the product line was changed to steel buildings which were produced until 2004. The facility is now closed. Hundreds of men and women were employed at this facility while it was under Armco Inc., and just as many have retired from it. The social hour on Aug. 7 is set for 5 p.m. A group picture will not be taken this year. Dinner will be served at 6:30 p.m. The cost is $15 per person. Dress is casual. The guest speaker will be former Major League Baseball pitcher Jeff Shaw. This reunion is for employees only, excluding spouses, friends, etc. “All employees who worked at this facility, whether under Armco or any other ownership, retired or not, are cordially invited to attend,” said an event organizer. Employees are encouraged to bring any memorabilia that they may have in regard to their employment. Reservations are required and must be made by Saturday, Aug. 1 by calling any member of the reunion committee: Gary Herdman, 948-2271; Betty Fulwider, 335-5449; Jack Hatmacher, 335-2939; John Mason, 313-7642; Hayward Riley, 937-981-3423; chairman Eddie Fisher, 335-4345; Deanna Edwards, 505-1658; and Wilma Dorn, 335-3476.